Staying true to the meaning of the word, Bistecca offers Jakartans an authentic Italian steakhouse dining experience like none has ever done before in the Big Durian. This latest collaboration between Chef/Restaurateur Luca Pezzerra, executive chef of Caffè Milano, and The UNION Group, may be new in town, but it’s already got mouths talking and drooling. Unlike Caffè Milano, which serves trattoria-style Italian dishes, Bistecca brands itself as ‘the new Italian American Steakhouse and Martini Bar’. That said, there’s no denying that the main attraction here is, of course, its Prime Steak Collection, personally curated by Chef Luca, a household name in the region’s high-end restaurant industry, with well established restaurants in Jakarta and Singapore. On top of the list is the 45-day dry aged Signature Bistecca Fiorentina—that comes from the Tuscan native cow breed named Chianina, specially flown in while chilled and never frozen. Simply seasoned with salt, pepper and herbs, the thick-cut meat is grilled over charcoal fire to bring out the texture and flavour—you have to really chew the meat to get the real taste of the beef. It’s the kind of rustic simplicity of the meat that Chef Luca wants his customers to appreciate, and judging from the well response from the diners, he seems to be doing an excellent job at that. Complete the main course with side dishes such as Bistecca Signature Hand-Cut Fries, Truffle Mac and Cheese, Creamy Parmesan Spinach, Green Asparagus with Hollandaise Sauce and Sautéed Mushrooms. If it’s pasta you’re looking for, like a true Italian ristorante, Bistecca offers a respectable selection of fine dining options. With pasta creations that include the tantalizing Black Ink Tagliolini and Jumbo Crab Meat with salmon roe and jalapeño as well as the delectable Goose Liver Ravioli, which boasts a winning combination of Parmigiano cream sauce and white truffle oil, diners face the daunting challenge of having to make a selection. At Bistecca, every meal is a pleasant experience for all senses with beauty all around, from start to finish. 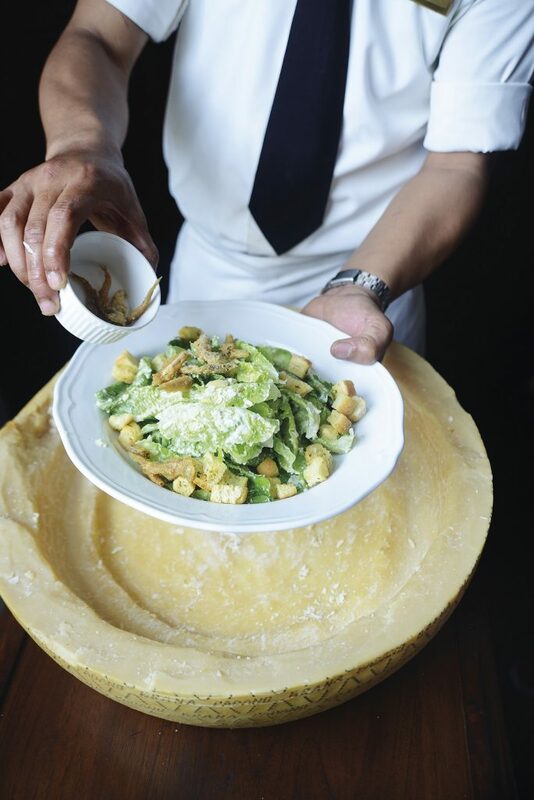 The stunning Bistecca Caesar Salad is prepared inside a massive 24-month-old Parmigiano Reggiano Cheese Wheel, served with crispy anchovies and garlic croutons. Diners can also opt for the luxury treat known as foie gras, which at Bistecca is translated as Pan-Fried Goose Liver served with toasted ciabatta, semi-dried Muscat grapes and balsamic syrup. To finish off, there’s the show-stopping Signature Baked Alaska—three layers of ice cream and cake topped with meringue with a flambé action. Other delightful selections to top off your meal include the Traditional Tiramisu, Gelato, Granny Smith Apple Crumble with Vanilla Ice Cream, Eskimo bar with Butterscotch Sauce and Kentucky Bourbon Crème Brûlée. Last but not least, the bar in this high-end, vintage-décor establishment offers something for all appetites, with its top sellers being the Bistecca Classic Martini and Chocolate Martini, as well as a vast selection of wines and other cocktails. Bistecca opens from 11 AM to 1 AM. Reservations are highly recommended, especially during weekends.